At sea, navigating officers are responsible for the piloting of seafaring vessels. They make use of the sun, moon, stars, landmarks, compasses and electronic radio and radar systems to keep the ship on course. In port, navigating officers have other duties relevant to the running of the ship, such as cargo work and safe ship keeping. directing or coordinating crew members or workers performing activities such as loading or unloading cargo, steering vessels, operating engines, or operating, maintaining or repairing ship equipment. Why did you choose this profession? From a young age I had a love for aviation, and US Navy fighter jets and aircraft carriers. Back then I wanted to pursue a career in aviation or navigation, specifically on an aircraft carrier. I learnt more about these career paths through my own research, and ultimately decided to enroll myself at a school where I would do two extra subjects to do with the maritime industry as a Grade 10 learner. What training did you undergo? I had the great advantage of obtaining a bursary from Transnet National Ports Authority to attend school at Simon’s Town High, where I did two extra subjects (Nautical Science & Maritime Economics). I gained an enormous amount of knowledge during those three years, which included various practical training and training voyages on ships. After I matriculated, I completed one year of my National Diploma in Maritime Studies at the Cape Peninsula University of Technology. The second year is required in order to graduate and to become a chief navigating officer or master mariner. After completing my first year, I joined a company to complete my practical sea experience (minimum 12 months). I am currently busy with my practical sea time at a Canadian-based company, Seaspan Ship Management, and I require five more months’ service before I am able to write my Deck Officer of the Watch unlimited exam, which will enable me to sail as a third navigating officer on board ships worldwide. I have also completed various STCW courses and other training at Samtra during the past year or so. Is there a type of personality best suited to this work? Yes, it’s definitely not for the faint-hearted. You should be a strong-willed person who knows what responsibility means, is able to make important decisions and can remain calm under pressure. Is experience as important as formal training? I believe that experience is one of the most important aspects. Most of your knowledge is gained during your practical time at sea and what you learn practically tends to stay in your memory. Describe a typical day As a navigating officer, your primary duties are to keep navigational watches. The watches are divided between chief, second and third navigating officers, each shift consisting of eight hours per day. As a third navigating officer, I would be in charge of watches (08:00–12:00, and 20:00–midnight). Additional responsibilities include the maintenance of life-saving and firefighting equipment, as well as any important task allocated to me by the master. There are also other secondary duties. What do you like the most? That each day poses a new challenge, and that the learning never stops. I love travelling around the world visiting major cities and meeting people of diverse cultures. What aren’t you keen on? Spending time away from home. Career highlights? The adrenaline rush that I get when navigating the world’s oceans in traffic-congested waters. Your goals for the future? To further my navigation career and to obtain my Class 1 unlimited license (master mariner). I would love to work ashore as a ship surveyor or marine harbour pilot. Advice for young mariners? You should be passionate and goal orientated. As a trainee officer, take in as much as possible because once you are qualified, you take on a great load of responsibility and there’s no room for mistakes. 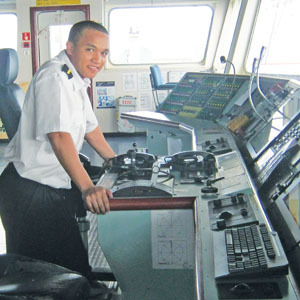 Aspiring cadets can enroll at a technikon to get a qualification in maritime studies. They must complete S1 and S2 (Certificate in Maritime Studies) to begin the process of becoming a navigating officer. After completing this course, the student will have to join a shipping company to complete a sea service training period and pass a SAMSA oral exam. It is then possible to go on to becoming chief navigating officer, followed by master, by completing S3 (National Diploma in Maritime Studies), S4 (Higher Diploma in Maritime Studies), further sea service, and SAMSA oral exams.